I bought Jessica Seinfeld’s Deceptively Delicious months and months ago, in the hopes of infusing some extra nutrients into some of the food our picky eater. I finally got around to making one of the recipes — D and I had it for breakfast yesterday — not the little one — but it was delicious either way. It was a real stick to your ribs kind of breakfast. It didn’t take much to fill either of us up. I accidentally put in too much peanut butter, which I think thickened it up a bit, but it tasted delicious either way. Oh — and it only took about 10 minutes to make. Can’t beat that! 1. In a small saucepan, combine the milk, sugar, pumpkin, vanilla and cinnamon. Bring to a gentle boil and stir in the oatmeal. 2. Reduce the heat and simmer for 2 to 3 minutes, until the oatmeal is soft and creamy (I went more like 5). Then stir in the peanut butter, if using. 3. 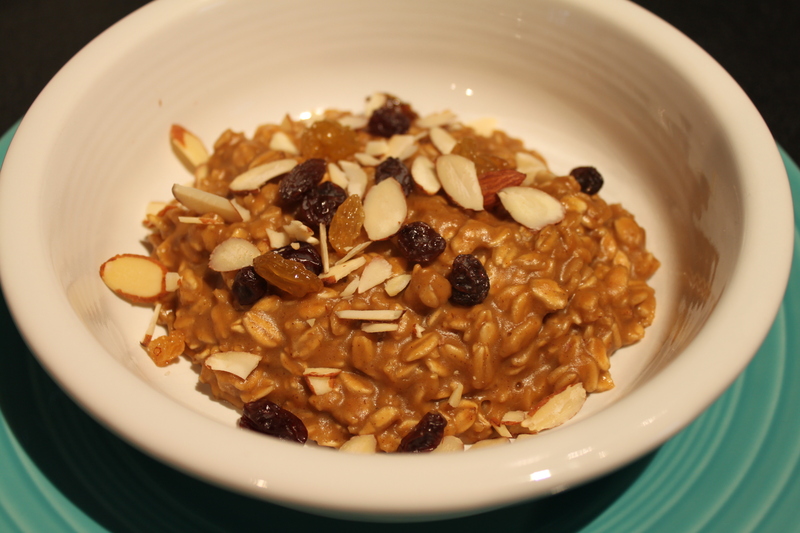 Spoon the oatmeal into bowls, sprinkle with fruit and nuts if you like, and serve with maple syrup. I just made this easy Italian-type dressing to go on my salad for lunch and it was pretty good! Might try it with a milder oil next time, but I think if it sat in the refrigerator for a bit the flavors would have been perfect. I’ll definitely use this again! 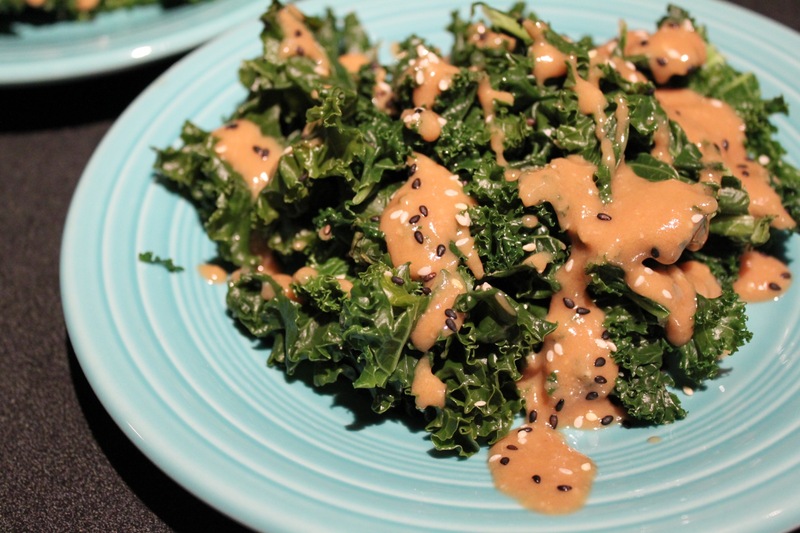 Last night I posted the recipe for a yummy miso dressing I made. To go with it, I made a very simple miso soup, which might replace Tom Yum as my go-to soup when I’m sick. But first, let’s chat about miso for a minute. I’ve been eating miso soup for years — first because it would be given to me free before my sushi arrived. I don’t know if my tastes have changed (well, yes they have changed since I was a meat-eater, obviously, but I’m not sure if that’s the culprit here) or whether I was just not getting the greatest soup, but I used to not be the biggest fan of miso. It has such a mild flavor, I don’t really know what I didn’t like about it. Fortunately, that has changed. There are many different kinds of miso, but the basics are that it comes from fermented soybeans generally. Though it’s pretty high in sodium (don’t worry — a little goes a long way — only a couple of tablespoons in 4-5 servings of soup), there are many health benefits. Miso contains protein (about 2 g. per Tablespoon), dietary fiber, omega 3 fatty acids, B12, zinc (great for immune function), copper and manganese. 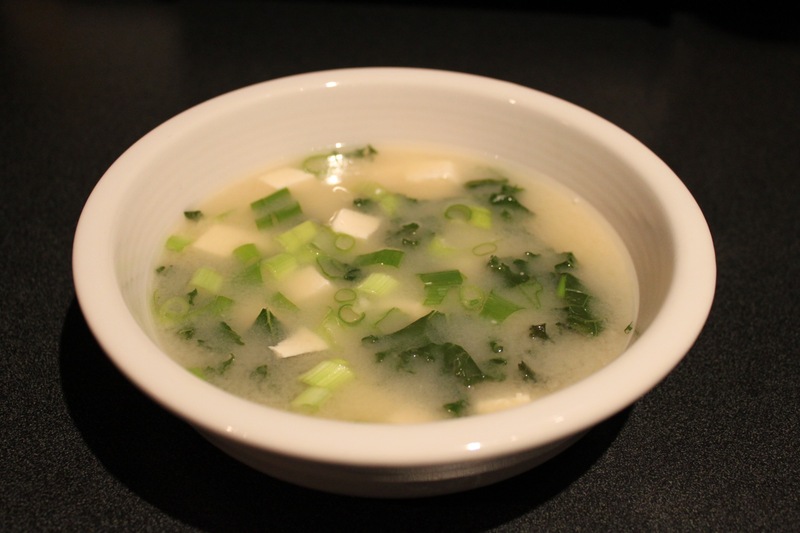 I still have some investigating to do with the many different types of miso, but I really liked the milk and not-to-salty flavor of the mellow white miso I used in this very basic recipe for miso soup. I imagine I will try many variations of this, including different greens, perhaps some soba noodles and something to spice it up a bit. 1. Boil 4 c. water and place miso in a separate bowl. 2. Once water is boiling, take a bit of the boiling water and whisk into miso until not lumpy (this is much easier than trying to incorporate it to the whole pot and get lumps out). 3. Remove water from heat and pour miso mixture into it. 4. Slice tofu into very small squares. I ended up using pretty close to an entire package, adding it a few minutes before serving. 5. Add sliced green onions and any greens you might have — I think spinach and watercress or herbs would be good too. Since I had steamed kale for another dish already, so I grabbed a couple of handfuls of it, chopped it up and tossed it in. It was smooth and not too salty and I think the combo of tofu-onion-kale was perfect. I can’t wait to mess with it and see what I come up with! I was whipping up a couple of side dishes for a potluck birthday party this weekend and decided to do something with the big bag o’ quinoa I picked up at Natural Food Patch Saturday morning. I set out to find a recipe reminiscent of a salad I picked up at the Holiday Market Du Jour deli a few weeks ago. This was similar, but even better (if I do say so myself!). It was insanely easy, and delicious. Simple and tasty (and it’s easy to make a lot!). This recipe made four or five cups of pilaf. 1. Bring vegetable broth to a boil, add quinoa and spices, return to a boil, then simmer over medium heat for 12-15 minutes or until liquid is absorbed and quinoa is cooked and tender. 2. Remove from heat and add raisins and nuts. Serve warm or cold. It doesn’t get much easier than that! I first made this three years ago after my friend Jay (my regular crafting partner in crime) made the original version — chicken tikka masala, as featured in an Indian feature in the September 2007 issue of Cook’s Illustrated. I vividly remember making in, in my little apartment in Chicago. I had about 2 inches of counter space, but I made it work and instantly fell in love. When I brought the goodness to Detroit, my squeeze fell for this dish hard too and it remains one of his favorites. That’s why he didn’t believe me when I said I have never posted it to the blog. I took pictures when I first moved to Michigan 2 1/2 years ago, but I never posted them (I didn’t love that first kitchen…or the camera I had). I’ve spent some time tonight going through each blog I’ve ever posted to verify it — it’s not here! So, now you have it. This is a different kind of comfort food. For something different, I added cauliflower and chickpeas to replace the chicken from the beginning and I’ve kept making it that way. I’m sure it would be good with different substitutions or with just chickpeas too (like most I’ve eaten in restaurants). I’ve always included the recipe with the cream it calls for, but decided to do a vegan version tonight. It was good, but lacking a little richness with almond milk instead. I think next time I’ll try coconut milk (which I’m out of at the moment). But it’s hard to make this recipe taste bad. And easier than you think! I served it with the onion stuffed flatbread I first made a couple of weeks ago (which is still very, very delicious). * Garam masala is a blend of spices. If you don’t have any (but it comes in handy, so pick some up! ), you can substitute with 2 tsp. 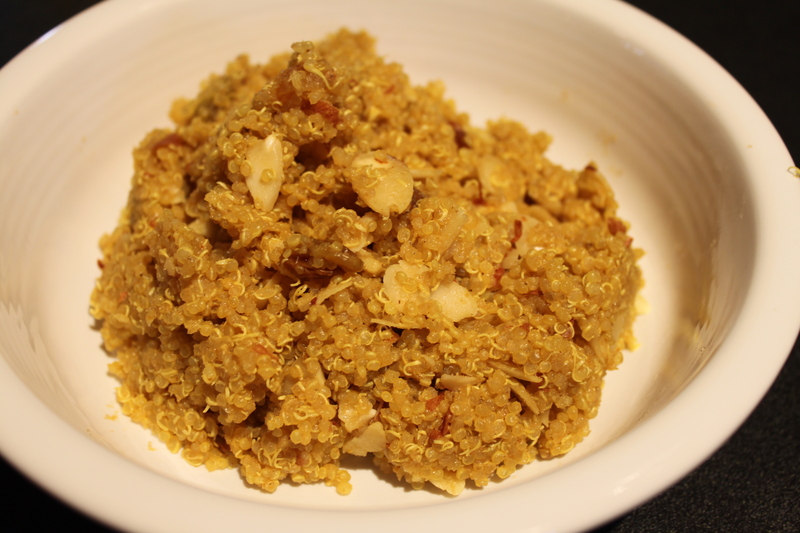 ground coriander, 1/4 tsp. ground cardamom, 1/4 tsp. ground cinnamon, and 1/2 tsp. ground black pepper. 1. Heat oil in a large dutch oven or pot over medium heat until shimmering. Add onion and cook, stirring frequently, until light gold, 8 to 10 minutes. At this point, the edges start to blacken and it might even be sticking to the pot a bit. No worries. 2. Add garlic, ginger, serrano chile, tomato paste and garam masala. Cook, stirring frequently, until fragrant, about three minutes. 3. Add crushed tomatoes, sugar and salt, bring to a boil. Reduce heat to medium/medium-low. 4. At this point I add coarsely chopped cauliflower. It takes a while to cook to tender (maybe 15-20 minutes), so I keep it covered and stir it every once in a while. 5. Add drained and rinsed chickpeas and let heat through. 6. Add cream/soy milk/coconut milk, stir in and remove from heat. 7. Add chopped fresh cilantro just before serving — I always serve it with brown rice. Gravy. Kind of sounds gross, right? But gravy is soooo good. Or it can be, anyway. I haven’t had gravy since I became vegetarian and for some reason I wanted to finally give it a try to complete my comfort food masterpiece. It was chilly tonight (understatement, perhaps) and I knew we would be heading out to trick-or-treat with the little one, so I thought we needed some good, hearty food. I made vegan stuffing (I used some help with from the store, with veggie broth and vegan margarine), vegan mashed potatoes (vegan margarine and almond milk) and sautéed together some lentils leftover from last week’s lentil burgers, onions, spinach, baby Portobello mushrooms in olive oil and veg broth. Then I set to making the gravy. This was extremely easy and I couldn’t believe how good it tasted. I think any meat-eater would have been impressed with this gravy! I think I was a little heavy-handed with the salt, but it was still really good. Though we’re both vegetarian, my squeeze doesn’t like to eat “fake’ meats or anything that smells or tastes like meat (whereas I like a good ol’ fake BLT from time to time…). I had to convince him (which didn’t take long) that it was just a “sauce” — don’t think of it as a meaty thing. Holy delicious. We both loved it. I didn’t photograph it because, well, gravy isn’t pretty. you know what gravy is supposed to look like. And it will become the right consistency — don’t worry. I think this would actually be good on biscuits with some fake sausage in the morning, for the record… I used whole wheat flour, so it was very “tan” in color, but if I had used white flour, it would have looked like traditional sausage gravy, I imagine. 1. Add vegetable oil to a small saucepan and heat to medium or medium low. Add onion and garlic and cook for about two minutes until a bit tender or translucent. 2. Add flour, yeast and soy sauce and it will be a thick paste. 3. Add water, little by little stirring/whisking well as you go. 4. Bring to a boil on medium to medium-high heat, stirring constantly, then lower to simmer. 5. Add pepper, sage and mushrooms (if you choose to). This only makes about 10 minutes to make and I’d make it right before you are ready to serve it. 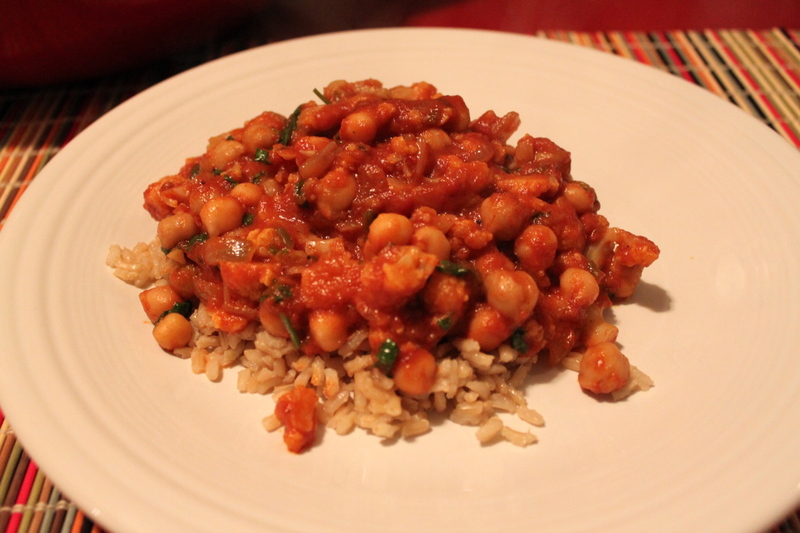 I can’t wait to make this again, and try it on meat-eaters! Search ingredients, restaurants, cities and other key words! Become a fan of I Eat Veg on FACEBOOK!